The State Bank of India stands for trust, security and stability. Shiv Kumar traces the origin, rise and reach of the institution that is visible in every part of india, and abroad, too. Its iconic status over two centuries makes it an unrivalled superbrand the nation can bank on. Built in the familiar dak-bungalow architectural style of the British Raj, with a stately pillared ‘porte cochere’, this building has housed the Allahabad branch since 1896. The two-storeyed building with a sloping tiled roof and portico for entry of carriages has been the Rajkot branch since 1921. 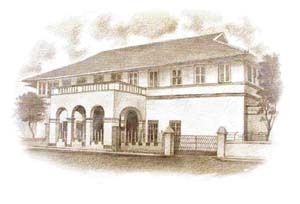 The Bank of Bombay established a branch in this erstwhile headquarters of Kathiawar state in 1909. 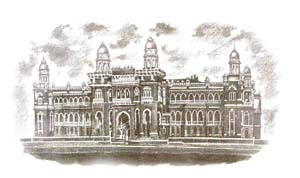 The magnificent structure that houses the Chennai main branch is an excellent fusion of Hindu and Saracenic architectural styles — marked by towers, domes and pillars. 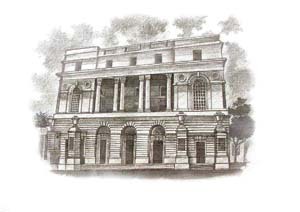 The Bank of Madras, established in 1843, moved here in 1898. 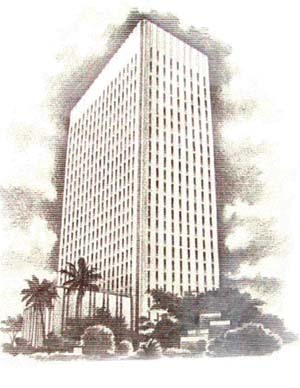 This colossal edifice, which symbolises the bank’s towering presence, was erected at Backbay Reclamation in 1971. The building houses the global headquarters of the SBI. ANY one researching a bank as ancient as the State Bank of India can always count on the odd customer to recall a forbear who bequeathed DNA and school house blazers along with banking relationships. "My grandfather used to bank with the SBI in town," says Melwyn D’Souza, who switched over to the State Bank of Mysore when he moved home to Borivli in North Mumbai. The age-old bond with the bank remained unshaken despite the dulcet tones of smooth-talking telemarketers tantalisingly beckoning from new private banks down the corner. So what if the suited-booted burra sahibs have handed over the baton to scruffy clerks in polyester and a brusque demeanour has replaced the old-world charm? It’s the solidity of the bank that matters to the customer. "Unlike the co-operative banks that have crashed after offering high interest, the SBI is still solid," says D’Souza. Millions of SBI customers seem to think like D’Souza. According to the bank’s annual report, its National Banking Group collected deposits worth Rs 3,04,211 crore in the last financial year. The SBI went on to become a major player in the home loan market with loans increasing more than 46 per cent from Rs 17,082.29 crore in 2003-04 to Rs 24,988.23 crore last year. The SBI’s origins lay in Calcutta — the then capital of British India — when it was born as the Bank of Calcutta on June 2, 1806, mainly to fund General Wellesley’s wars against Tipu Sultan and the Marathas. 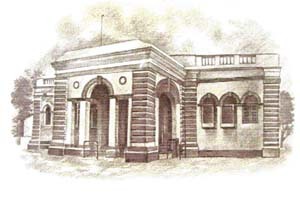 It was renamed Bank of Bengal on January 2, 1809. Gradually, similar joint stock banks, the Bank of Bombay and Bank of Madras, came up in 1840 and 1843, respectively. These three banks formed the highest tier of the apex banking system in British India, native India and Burma and were also responsible for issuing paper currency. In 1862, the Government of India assumed sole charge of printing paper currency and the three banks as bankers to the government were mandated to manage and circulate the new currency. In May 1876, the three were brought under the Presidency Banks Act to be governed by similar rules. In 1921, they, with their 70 branches, were merged to form the Imperial Bank of India. It took on the triple role of a commercial bank, a banker’s bank and that of a banker to the government. In 1935, with the establishment of the Reserve Bank of India, the Imperial Bank ceased to be the banker to the government. It, however, became the RBI agent for transaction of government business at centres where the Central Bank was not established. Simultaneously, the Imperial Bank also entered the business of dealing in foreign exchange. After Independence, India embarked on the Five-Year Plans, and several state-owned banks were merged with the Imperial Bank of India to form the State Bank of India in 1955. Four years later, the State Bank of India (Subsidiary Banks) Act was passed for enabling the SBI to take over eight former state-associate banks as its subsidiaries (later renamed Associates). In the decades since then, the SBI has grown by leaps and bounds, rapidly adapting to advances in the financial and banking world. New lines of services and products kept getting added not only to meet multifarious needs but also to stay ahead of the competition. If Union Finance Minister P Chidambaram has his way, the SBI would emerge as a major player in other sectors as well. Addressing the SBI’s bi-centennial function in Mumbai earlier this month, Chidambaram said the SBI must become a multi-product financial centre. Chidambaram promised to permit increased foreign shareholding in the SBI so that the bank could access more capital to expand. As things stand, the RBI holds 59.73 per cent in the SBI. This may be brought down to 55 per cent. Another 20 per cent is held by foreign investors, including FIIs and GDR holders, and the rest is held by Indian investors. Chidambaram would like the SBI to issue more shares in Indian and international markets. Despite the SBI scrip breaking the Rs 685 barrier, it remains attractive to investors, say market watchers. The bank declared a dividend of 125 per cent in the last financial year on operating profits of Rs 10,990 crore. The SBI’s net profit amounted to Rs 4304 crore ($989 million). In other words, the SBI is just a whisker short of the billion-dollar mark and bids fair to join other blue chips like the ONGC, SAIL, NTPC and Reliance Industries. Determined to emerge as a major global player, the SBI is now aggressively looking outwards. Its network of subsidiaries include in its kitty include the SBI (Canada), SBI (California), Indo-Nigerian Bank and the SBI International (Mauritius) Ltd, besides joint ventures with Nepal SBI Bank Ltd, Bank of Bhutan and Commerical Bank of India, Moscow. SBI chairman Arun Kumar Purwar said, "The bank has set a vision to provide world-class services at home and in the world to customers." Later, Purwar unveiled ‘Project Vijay’ to put the SBI on the global banking map. "The bank has drawn up an ambitious plan to be in the big league. By 2008, the SBI plans to rank itself among the top 50 global banks and among the top five in Asia in terms of assets and Tier-I capital," Purwar said. Project Vijay would be achieved by organic and inorganic growth. Apart from acquiring small and medium banks in different parts of the world, the SBI would open more branches worldwide. It currently has offices in 32 countries. By the end of this year, the SBI is likely to open 76 offices in 35 countries. The SBI is now working on making its financial statements compliant with world standards. The bank’s balance sheet and accounts would meet the GAAP standards by March 2006. The SBI has also set up a venture for credit and debit cards with GE Capital. At home, the SBI continues to expand its presence. Along with its associate banks, it is the country’s largest banking network with a market share of 25 per cent, 1,400 domestic branches and 5,200 ATMs. According to managing director Ashok Kini, 6000 of the bank’s 9000 branches are in rural India, where it is targeting self-help groups (SHG) and artisans in a big way. Kini said the bank had target to extend credit worth Rs 5,000 crore till March 2008 to more than 1.5 crore SHG members. With the increasing pressure to consolidate for taking in competition, the SBI is moving towards a merger of its seven associate banks. Sources say that a virtual merger is already in place with integration in information technology, treasury operations, accounting practices, systems and procedures and exchange of market information. The banks are to shortly begin sharing human resources as well. Prime Minister Manmohan Singh feels that the SBI should show the way forward to all banks in widening and deepening the market for rural credit, financing infrastructure development through innovative products and better risk management capabilities. "You have to leverage your strengths, develop new capabilities, and show initiative to venture into uncharted territories so that you continue to be in the vanguard of India’s growth in this century," Singh said at the bicentennial celebrations. With the rush to go where the customer is, the SBI is offering new technology products, including Internet banking, telebanking, electronic fund transfer, e-payment, etc. it has also entered newer markets like vehicle finance, a preserve of small private-sector companies. Its newest addition is the first ever ‘floating ATM’. The floating ATM was set up by the Kerala Shipping and Inland Navigation Corporation on a ferry between Ernakulam and Vypeen Islands. The ferry makes about 30 trips a day and carries nearly 5,000 passengers and their vehicles daily. Be it in these backwaters or uncharted markets across seas, clearly, India’s most favourite bank is going places.